Cheap, and worth the bother! 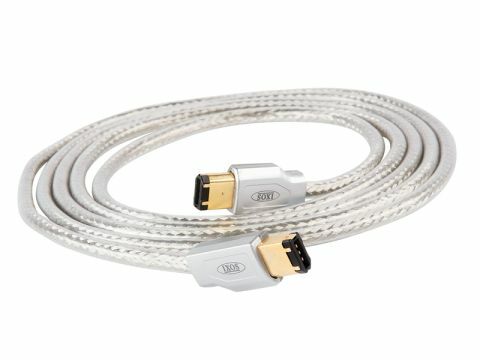 FireWire cables are something of a novelty in the audio world despite its established presence in the video domain and a growing number of pro and semi-pro audio devices now using it. This is why we have chosen to review the Ixos XDF03 FireWire cable. Physically, it's similar to USB, whether comparing the cable or plug size, or its flexibility in hooking up to a range of devices. But FireWire is certainly better suited to real-time applications like audio and video. In particular, although its notional data rate is similar to USB, it is capable of handling considerably higher real-time data rates such as those of multi-channel high-res audio. For this, our first-ever review of a FireWire cable, we used a semi-pro DAC from TC Electronic as a test bed, feeding it both normal- and high-res files from a PC. Our 'reference' was the basic cable supplied free with the DAC. The Ixos XDF03 uses OFC conductors, dual screening and gold plated connectors, which certainly make a more satisfying mate with the female receptacles than those on the free cable. While the field is still wide open, it's clear even from this limited experience that FireWire cables follow the same trend as S/PDIF and mains cables that likewise 'shouldn't' make a difference. Because they do and while it's perhaps not as marked as one might find from changing speaker cables it's still worth taking a bit of trouble over. With the Ixos in place, the sound sharpened up a little all round, subtly extending the bass and treble, while stereo images were distinctly more precise and stable. The contrast between instrument and voices in the mix also improved quite noticeably.